The biggest problem I had with this album was the German language. Since this is a language I have absolutely no understanding of, I had difficulties not only with the titles of the tracks, but with the many spoken words that came out of my speakers. This is, of course, not the problem of Iri Li and Ralf Rabendorn, the duo behind the Infinitus ensemble, but mine alone. The medium might be the message in this album, and these words that I hear, words I cannot comprehend, are making this message a different one to me than to people who can understand what they hear. “Na, Poleon?”, to me, is a complicated blend of radio samples and various musical instruments (Synths, Percussion, Theremin, Singing bowls, Drums, Field recordings and a lot more) that Iri li and Rabendorn are carefully mixing together. The German language? Well, it serves as a mere musical instrument. Problem solved. The album begins with a disturbing, yet soft music, which is accompanied by the voice of Iri Li, speaking words that dissolve into the enchanted musical environment. Drums appear and slowly the track gains a shape, and a momentum, only to end as soon as it reaches its full power. When it ends, the second track offers a much more demanding voice, surrounded by what seems like body-produced sounds and flies. Later on more elements will emerge. Sharp noises, blurred and distant howling and tense build ups that make me pretty disoriented. Voices merge perfectly with radio bites that seem to answer their questions and sounds pop out of nowhere and keep me tense throughout the whole experience. The eleven tracks are gathered to produce one long and hellishly surreal trip. I no longer care about the words I am hearing, as they keep diffusing into the music. The comforting voice of Iri Li brings moments of calm, only to be shattered by the twisted sounds seconds later. When it ends, with the announcement of another swarm of flies, time begins to flow normally again, as it too has been smeared and blurred while the music was playing. The majority of “Na, Poleon?” was recorder back in 2005, while the album itself being completed and released on 2010. It was a worthy wait, as “Na, Poleon?” resulted as an intense, surreal and diverse album, being demanding even at its calmest points, as a lone piano plays over dead silence. Even at this point, you know you need to expect some surprise that is lurking in the shadows. Iri Li and Rabendorn must have put it for you somewhere, setting another stone on their paved road of a great album. 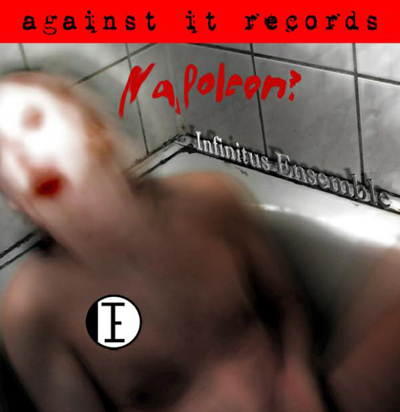 1 Response to Infinitus Ensemble – Na, Poleon? iri and ralf are incredible. amazing artists, solo or with this ensemble.